There’s something special about RC Monster Trucks, and it’s not so easy to explain. Perhaps it’s because these custom vehicles can do things and go to places other models can’t. Maybe it’s the sheer size, the might, the incredible designs, the ‘wow’ factor, and accessories. Or perhaps it’s a bit of everything and nothing in particular. This page looks at the best RC truck choices around right now. Ultra-grip TPE tires. 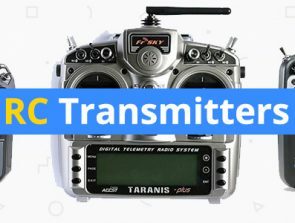 Built-in tri-band control. Brushless KV3800 motor. Soft rubber compound tires. Fast racing monster truck. Gas-powered engine. So you want a truck that has lots of power and spirited performance. You need a model that becomes a natural extension of you and your personality to get the most of the vehicle. It’s the human/machine team—not just the truck—that conquers all. 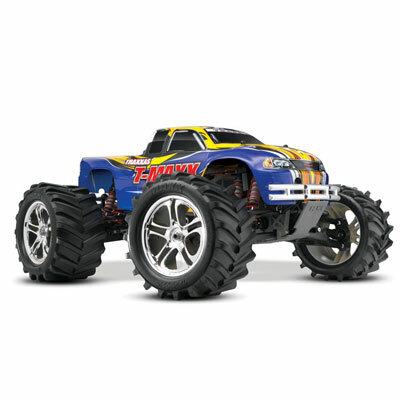 This guide helps you to discover the best radio-controlled monster truck for you or as a gift. It has to match needs, appeal to senses, and meet expectations. OK, let’s break these three considerations down into plain English. Be mindful of what you buy, especially if you’re a novice. Try to resist the temptation to jump in and snap up the most powerful beast you can afford. Nitro-powered trucks give you more oomph than electric vehicles, but there’s a downside. Trucks powered with nitro gas can also be buggy and need regular maintenance. Tweaking is okay if you’re a tinkerer. It’s a time-consuming hassle if you’re not. The good thing about nitro gas-powered RC monster trucks is that you get intimate with the vehicle. Knowing how it works from the inside out is sure to help you become a better RC driver over time. Electric monster trucks are low maintenance and the best option for entry-level users. They lack the power, performance, and speed of nitro trucks, but it’s better to start at the bottom and work your way up. There’s plenty of time to move up to nitro vehicles if you develop a real passion for the hobby. The initial sale price is not the only consideration. 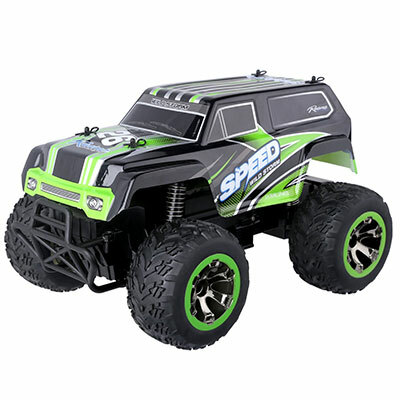 Electric monster trucks run on rechargeable batteries. Some batteries are better than others are, but they all have their maximum running time. That means buying extras unless you want to be out of action as you wait for recharging. Take the price of spare batteries, average running time, and recharging times into consideration. The choice should be ready-to-run (RTR) if you’re new to the hobby. That means your model is just about ready to race out of the box. Assembly kits are for users who are more advanced or those who want to learn how to build and customize their trucks. All the picks in this guide are RTR. Just make sure the truck has a design and a quality of build that’s fit for your purpose. I’ve included seven models in this straightforward buyers guide. These short, no-nonsense reviews are void of unnecessary jargon and technical terms. 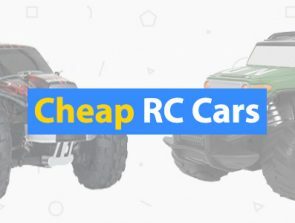 The RC monster trucks listed here are the result of personal research, real user feedback, and the opinions of industry experts. At the end of each review, there’s a quick break down of the key specs, pros, and any cons for each model. The table below shows these popular monster trucks as they appear in the guide. The order is by price and starts with the least expensive models at the top. 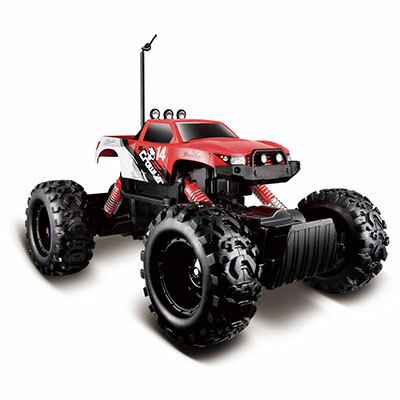 The first pick is the Maisto RC Rock Crawler. This little-BIG monster truck has been around for a few years now and still sells well. What this beast lacks in features it makes up for in performance. Any toy-grade monster truck has to check two boxes—good looks and performance. The Maisto RC Rock Crawler doesn’t disappoint on either point. The effective low gearing lets it move easily off-road across the most rugged of terrains. The trucks front and rear articulated suspension system also help mobility across rougher landscapes. The small truck body always stays clear of the flexing wheels. Large ultra-grip TPE tires with aggressive tread patterns add further to the Rock Crawler’s appeal. The truck has two motors though it’s not fast, but it’s fast enough and has plenty of torque. Driving over rough ground with bumps and dips needs a robust and steady performer. It’s more a test of skill than speed. Experienced users can scale obstacles and maintain traction with relative ease. Less experienced drivers have heaps of fun learning how to control this toy beast. The 27 MHz built-in tri-band is a handy feature. It lets you run more than one truck without having to worry about radio interference. This model comes in a choice of three colors—yet another welcome touch. The Maisto RC Rock Crawler needs eight batteries to run, six for the truck and two for the transmitter. Alas, you have to purchase them all separately. It’s a good idea to buy rechargeable batteries to keep costs down in the longer term. Other disadvantages are the single speed and wide turns that make it a little harder to control. For the price, though, it’s a real winner in my book. The Blexy RC All Terrain Stunt Monster Truck is an entirely different looking beast to the first pick. It’s also a two-wheel drive and a competent one at that. The Blexy Stunt Monster is a high-powered, high speed, racing truck. It can reach speeds up to 30km/h in ideal conditions. 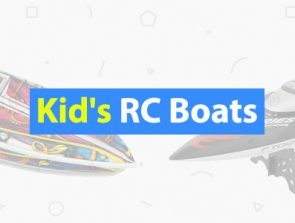 That’s fast—too fast for young users—for an RC model in its class. It has incredible acceleration (pick up speed) too. The long 50m control range allows for plenty of racing space. This model is also a capable all-terrain vehicle, i.e., mud, sand, lawn, gravel, and rock, etc. The 4-wheel independent vibration system adds to the fun. It allows you to adjust the position of the car relative to the ground based on needs. It’s handy for when the driver wants more acceleration, for example. The explosion-proof PVC material build is as sturdy as it sounds. Most users don’t have to worry though. The thick anti-skid rubber wheels help to keep the truck on course—most of the time. It seems too good to be true considering the price, but there are a few downsides. The Blexy RC Stunt Monster Truck is insanely fast. The vehicle’s speed is one of its attractions, but it may prove too quick for younger players and RC novices. The high power also drains batteries faster. The truck will only last about 20 minutes on a fully charged battery. Charging takes around 3-hours. Three hours is not extreme, but I’m sure impatient youngsters will disagree. One battery comes with the product, but you might want to buy one or two extras to extend the fun. Now we’re at a new level in toy-grade monster trucks. 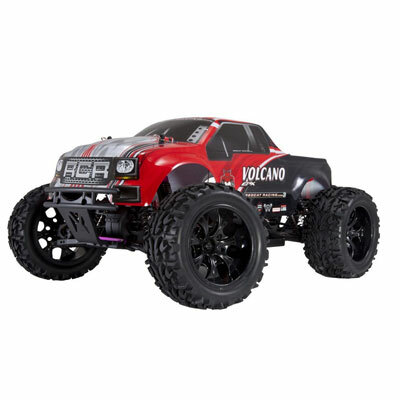 Meet the Redcat Racing Electric Volcano EPX complete with a pistol grip 2.4GHz radio. It’s a good-looking truck, but how does it go? It’s worth noting that this 1/10 scale hobby-grade monster truck is not a kids toy. Redcat does not recommend it for anyone under the age of 14. It’s not cheap either, but don’t let that little detail deter you. All the parts are 100% replaceable if you happen to damage something. It’s not easy to break, though, thanks to the shatterproof polycarbonate body. They’ve also waterproofed all the electronics. A brand new model is ready-to-run (RTR) out of its box. You may have to charge the battery(included), but other that it’s ready to roll when you are. The range of this FCC approved truck is a remarkable 100 yards or 300 feet (91m). The impressive 2.4GHz radio deserves a review of its own, but I’ll summarize its best features here. Racers can run up to 10+ vehicles at the same time without having to worry about interference. The pistol grip has all the controls you need at your fingertips. There are dual rate adjustments, plus steering reverse and throttle reverse switches. 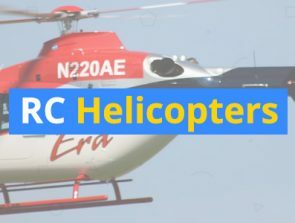 Alas, the RC needs a lot of power to run (see below). I must draw attention to a few other key features as well. The Volcano sports electric brushed motors, it has an independent suspension system and a lightweight chassis. The Full-Time 4WD powers all wheels at all times. Full-Time 4WD helps to maximize maneuverability across all terrain types. It’s great that this monster truck is so powerful, but there are sacrifices for power. A new pack includes a truck battery and battery charger. The long 6-hour plus charging time is a pain. Add to this the short 20-minute running time, and you can see the problem. You may want to add one or two extra batteries to the final cost if you’re to get the most out of this beast. The remote control (RC) needs eight AA batteries (not included). 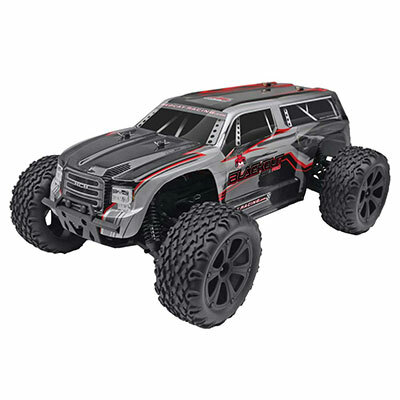 The power-hungry setup of the Volcano RC monster truck is sure to affect some people’s buying decision. And finally, there’s the instruction booklet. Beginners, in particular, are likely to find them vague, especially for the RC. Here we have another quality monster truck from Redcat. This one is the Racing Blackout XTE PRO. Users can look forward to a real ‘adrenaline explosion,’according to the company. The inviting cab and stylish design look authentic albeit on a smaller 1/10 scale. Still, it’s an exciting alternative to the real McCoy once everything’s charged up and ready to go. The Blackout XTE PRO has a powerful brushless KV3800 motor and a sturdy polycarbonate body, but maybe not quite sturdy enough (see below). It’s fast too, boasting a top speed of around 30+ mph. The Blackout XTE is a shaft driven 4WD with plenty of traction. Skilled racers can easily maneuver and negotiate the toughest of obstacles. The forward/reverse ESC functions help drivers navigate those more awkward and tighter spots. There’s no stopping this beast once it’s on the move. Competitors always know when you and your truck have passed through by the destructive path left in its wake. A few other points to mention are the independent suspension, shaft drive 4WD, and speed controls. There’s also the lightweight plastic chassis and the oil filled adjustable shocks. It’s as realistic as a hobby-grade model can get and therefore not suitable for anyone under the age of 14. The high speed is not to everyone’s liking. Inexperienced users risk losing control at fast speeds and crashing the truck. It’s not an easy truck to steer, either. Entry-level users who buy this truck are likely to mess it up and leave negative reviews. Expert RC racers have different experiences. Some users complain that the truck’s not robust enough. I agree. It should have a harder body due to its high speed and high crash potential. The Traxxas Stampede 1/10 scale 4WD Monster Truck sells well despite its higher cost. It’s another serious hobby-grade vehicle so let’s see if it’s worthy of the price tag. The Traxxas Stampede Monster Truck has a modular design—most trucks in its class don’t. It’s newsworthy because a modular design makes maintenance so much easier. For example, it now takes around 60 seconds to remove both the front and rear sections. That makes it quick and easy to maintain, replace parts, and carry out various adjustments. A powerful Titan12-Turn 550 motor powers the Stampede 4X4. It has an efficient integrated cooling fan that results in extended life, faster speeds, and better runtimes. The top speed is a fast 30+ mph supported by the waterproof XL-5 speed control. The XL-5’s Training Mode™ reduces power by around 50% so that newbies can develop skills at their own pace. That’s another unique and welcome feature. The high-torque servo also deserves mention. It provides the truck with reliable control that’s crucial for accurate, responsive performance. Everything about this model oozes quality and precision. 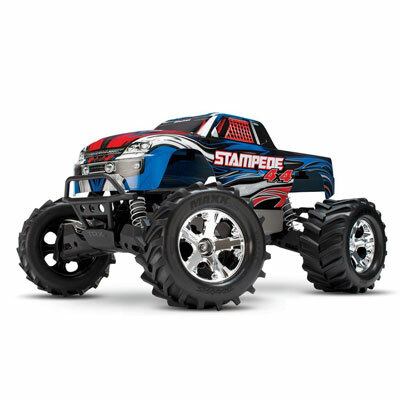 The whole family can enjoy the Traxxas Stampede Monster Truck. The company targets it at serious enthusiasts—reflected in its precision and price. There are far cheaper options for entry-level users. It’s not a good idea to let youngsters use this speedy monster truck unsupervised. Yes, it’s robust and can take a few knocks, but it’s also expensive. These are more observations than complaints. It’s undoubtedly an excellent truck for families to enjoy together. The main gripe is the battery charger. It comes with a charger that plugs into a regular vehicle cigarette lighter (not the wall). That’s not ideal for Joe Average user. Remember to use the long cord to charge the battery outside a vehicle for safety reasons. This Traxxas is the first of two nitro-powered monster trucks. The most notable thing is the price hike, but that’s easy to justify for many nitro-powered truck enthusiasts. 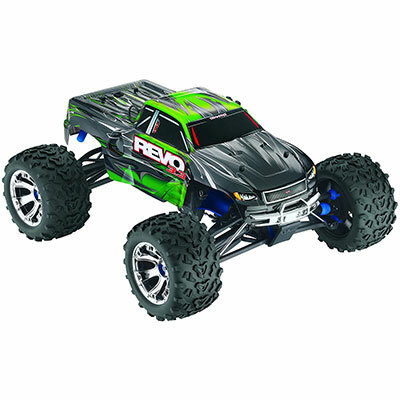 According to the company, the new and improved Traxxas Revo 3.3 Nitro Monster Truck has a lot going for it. It’s bigger, sturdier, and more versatile than previous models. The Traxxas Stability Management (TSM) enhances performance with extreme power, faster speeds, and quicker acceleration. It’s a feature-rich truck with lots of innovation and endless capabilities. The Traxxas 3.3 racing engine is the power behind this brute. The pre-installed telemetry sensors are also worth a mention here. They let racers view the vehicle’s speed, RPM, and temperatures right from the Traxxas Link dashboard. The Revo 3.3’s sports a dual digital waterproof servo steering system. This invaluable system ensures powerful and reliable responsive handling at all times. You can’t help but notice the truck’s wide, tall stance. Traxxas has mounted 6.3″ Maxx-sized tires onto gorgeous Geode wheels. Combined, they give the vehicle a touch of elegance with an air of arrogant menace. Everything you need to get started is right there in the box. It’s Ready-To-Drive (RTD), and that means it comes with the NiMH receiver pack and the EZ-Start battery. Enthusiasts who buy this monster truck love to give it a personality. Parts are readily available, there are upgrades too, and it’s easy for hobbyists to work on. It’s fair to say that the Nitro-Powered Revo is better at racing than it is bashing. If bashing is more your thing, then compare the Revo to alternative trucks before you decide. The only other drawback to this truck is its price tag. It’s costly for entry-level enthusiasts still finding their way. Final word: Remember, this is a nitro-powered (gas) monster truck, not a battery-operated model. The Traxxas T-Maxx is a 2.5 4WD Monster Truck and the second gas-powered model in this guide. It’s a beast in every sense of the word, and it needs an aggressive driver to control it. If there has to be a gold standard of all Monster Trucks, then it has to go to the T-Maxx®. Reputation is not something any company can buy. Traxxas has undoubtedly earned theirs. Its various accolades and awards include Best Nitro Truck, Truck of the Year, and it’s a best-selling brand too. There’s more, but this gives you an idea of the attention to detail that’s gone into this model. Now let’s look at the wheels and tires. The wheels are split-spoke mirror chrome type with mounted with 3.8″ Maxx® Chevron tires. Traxxas pre-glues the tires with quality foam inserts. These things combined guarantee fun and unrivaled performance across any terrain. This nitro-powered monster truck can reach fast speeds up to 45mph—that’s fast. Maxx has a fully enclosed automatic transmission with two-speeds forward and two-speeds reverse. There’s a speed-sensitive reverse lockout feature too. The truck’s fast, adjustable wide track independent suspension is a long travel design. It has two effective shocks at each of the wheels for improved damping. The Traxxas T-Maxx 4WD Monster Truck is one of those models you could write about forever. I can’t find any significant faults with this truck. They could have included some wheelie bars I suppose. Still, that’s nitpicking rather than an actual product flaw. The other thing some users will find tricky—the novice in particular—is breaking in the engine. It’s an expensive hobby-grade monster truck and an excellent choice for all enthusiasts, but it takes a while to become familiar with it. I am interested in your drone flying class. I live in Los Angeles area. Can you give me more information?